Chris Cornell's widow says her late husband "will live forever in the present." 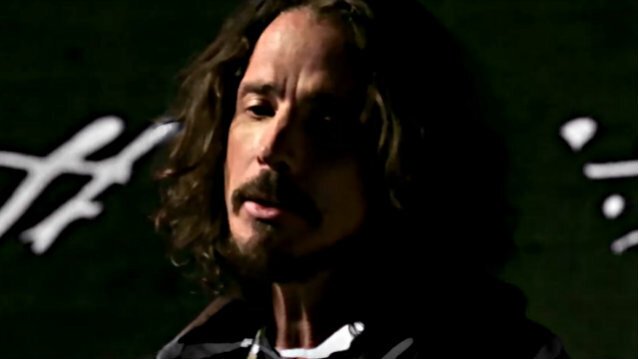 The singer was found hanged in his room at the MGM Grand Detroit hotel in May 2017, following a SOUNDGARDEN show at the city's Fox Theatre. His body was found soon after he had spoken with a "slurred" voice to Vicky Cornell by phone. The SOUNDGARDEN frontman was buried a week later during a private service at Hollywood Forever Cemetery. "While May 18 will forever mark the worst day of my life, the 26th... marks the second," Vicky wrote in a note posted on Twitter. "The day I was forced to lay the love of my life to rest. I wasn't ready... I'm still not ready. I didn't and don't want to bury my husband." Vicky led a public vigil in Chris's memory at Hollywood Forever on the first anniversary of his death. She was joined by his children Lily, Toni and Christopher, plus his bandmates Matt Cameron, Tom Morello and Alain Johannes. Chester Bennington's widow Talinda and Johnny Ramone's widow Linda were also in attendance, along with other friends and a number of fans. "Being back at Hollywood Forever last Friday night was stepping into a place that serves as a reminder of what I've lost, a missing piece that hurts so much," Vicky continued. "But seeing you all and feeling so much love renewed my feelings of hope and gave me the strength to keep going, to continue to honor him and not lose sight of all I have to be grateful for. "I will speak his name every day," she added. "I will continue to keep the promise for him and Chris will live forever in the present." Earlier this month, Vicky said that she and her family were still "looking for answers" about her husband's death almost a year after he hung himself. According to The Detroit News, Vicky continues to question the official ruling on Chris's death, saying that the medical examiner conducted a "botched investigation." Vicky said that inconsistencies in the official narrative have led to false accusations and online attacks on her family. She explained, "This has left me and my family still looking for answers, but at the same time, set off this whirlwind of conspiracies. Some of the people are just fans looking for answers, but some of them are conspiracy theorists who have said the most vile things to my children and me." Vicky has continued to focus on the autopsy report stating, "Drugs did not contribute to the cause of death," calling the statement completely misleading. She remarked: "The poor choice of phrasing has misled the public to believing he was of sound mind and body. So some conspiracy people think if Chris wasn't impaired, he would never have killed himself, and so he must have been killed — and then they start getting into the rest of the holes." Vicky maintains that her husband was impaired at the time of his death, with Dr. Richard Cole from the University of Miami's Miller School of Medicine corroborating that drugs likely played a part in the singer's death. Cole wrote: "There is clear evidence of drug ingestion leading to impaired behavior. The drugs that were found — and their levels — strongly indicate doses that would impair mental and motor function individually, but have much more powerful effects when found in combination." Vicky Cornell is adamant that Chris "did not have control of his faculties due to toxicology" when he hung himself from a bathroom door using an exercise band. She added: "Had the medical examiner looked at all these factors, maybe they wouldn't have concluded it was a suicide in just an hour and a half."